September 2016 - ID Studios, Inc.
Kelsey Held joined ID Studios earlier in the year as a Senior Interior Designer. Since graduating from California State University, Long Beach she has worked for over six years in the corporate and hospitality realm in both San Diego and Los Angeles. Kelsey’s experience expands our knowledge base in those services. She joins us in our Designer Forum sharing Trends in the Workplace Today. We’ve come a long way from the maze of dark corridors and rows of enclosed offices. Businesses these days thrive on collaboration and flexibility and the traditional way of planning just doesn’t work for most companies anymore. With the high cost of rent, we’re trying to fit more people in a space but we’re not willing to compromise comfort or productivity. 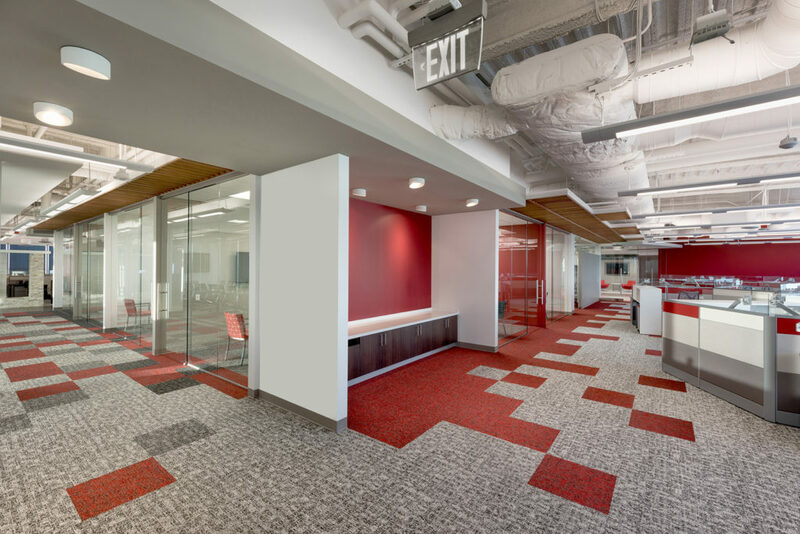 When it comes to workplace design, the approach to designing office space has experienced some change. Similar to urban planning, we’re creating a mini community! With open planning, we’re organizing employees into “pods” according to need. By creating zones for similar requirements, we’re eliminating many of the walls, making your space feel bigger. If you’re still craving a physical partition, spaces can be divided by low walls or movable screens which still maintain a level of privacy and light. Minimizing communication barriers creates support, connection, and collaboration. Flexibility allows you to get the best bang for your buck. It allows for growth, change, spontaneity, and creativity. Conference rooms that open up completely with folding or sliding doors help to create larger gathering spaces. You can have all-hands meetings or training sessions as well as group events. 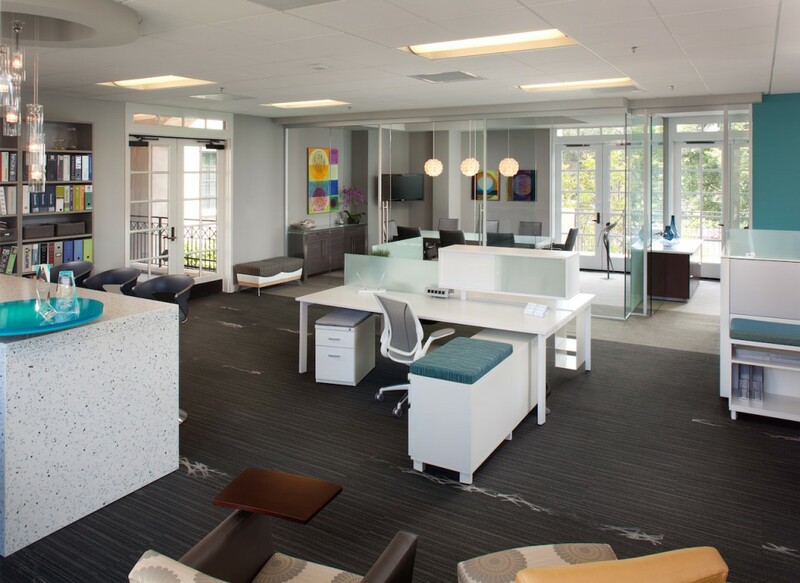 Mobile seating and screens can create space as needed for brainstorm sessions or less formal meetings… or they can serve as huddle spaces for quick touchdowns! Less and less people are working at assigned desks. Some work remotely from home or on business trips and some people rarely report to an office at all, conducting much of their business in the field or on their phone. Having smaller “touchdown” desks for employees that aren’t in the office 5 days a week or 8 hours a day takes up less space and is more efficient. Another added benefit – it’s cleaner! People are essentially borrowing a desk, which reduces clutter and unnecessary mess. With employees not accustomed to open planning environments, the biggest concern you hear is about privacy when it comes to phone calls. A couple phone booths or small rooms sprinkled throughout the space alleviates that concern and only needs to be large enough for one or two people who need a place to “perch” for a while. 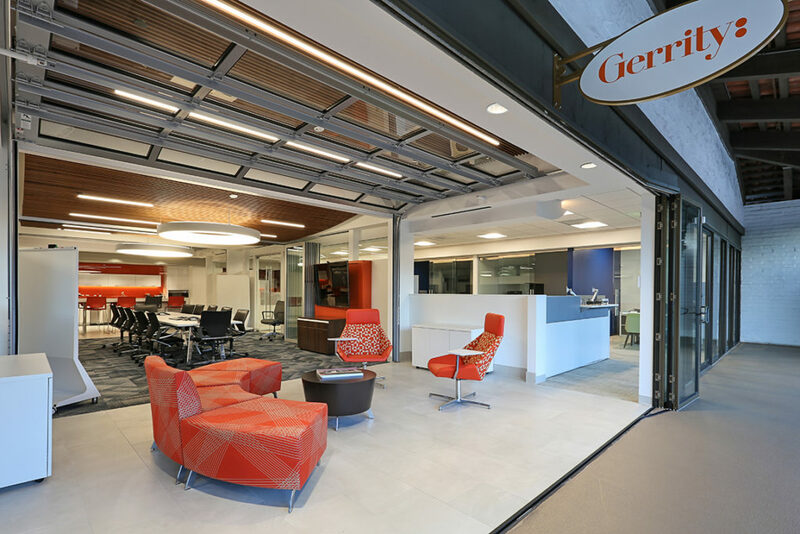 A far stretch from the phone rooms that were designed 20 years ago, add a small counter or table with a chair and it can also serve as a touchdown spot for someone with a laptop! With changing technology and a variety of preferences when it comes to how people work, it’s not just about a good chair anymore. The biggest impact is a flexible work surface that allows for sitting as well as standing… and it doesn’t have to cost a fortune! 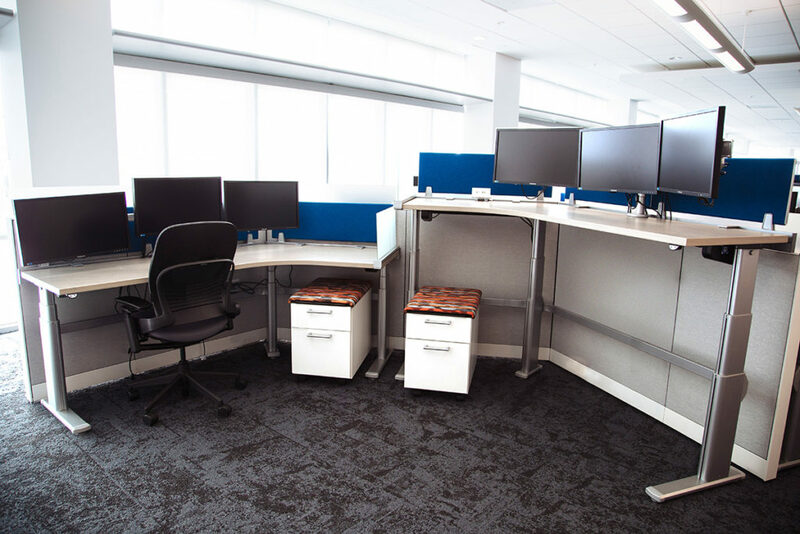 More and more employees are demanding height adjustable desks and manufacturers across the board are coming up with their own version. Flexible furniture promotes good posture and movement throughout the day, which in turn promotes productivity. As a bonus, think about making a smaller conference table a standing table! This would be for shorter, impromptu meetings that are meant to be more interactive. Take it even further by making the top of the table a white board or other writeable surface… it gets people up and moving and keeps them awake! We love fresh air in San Diego and we’re fortunate to have amazing weather nearly year-round to take advantage of it! If you’re lucky enough to have a space that can open up to the great outdoors, consider an operable, glass garage door that brings light in, even when it’s closed. 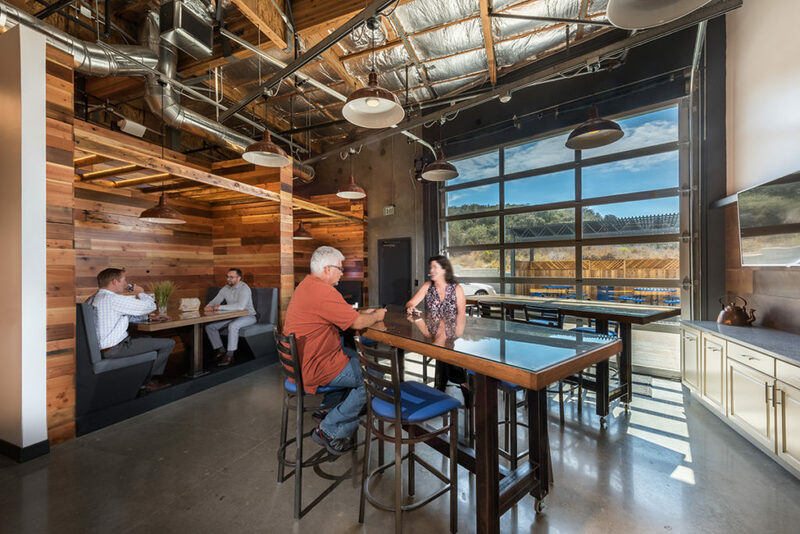 Operable windows and folding doors go a long way… and if you’ve got a patio or roof space, create an area for outdoor meetings, team BBQ’s, or after-work happy hours! It may seem counterproductive to put a Kegerator, slide, or ping pong table in your office, but it can actually be quite the opposite! Having an outlet for employees allows them to burn off steam and enhances working relationships. It certainly improves mood and satisfaction, which can have a big impact on a team’s success. So why do we strive for this new way of working? Because people and their overall sense of work/life balance matter. If there’s one thing that ALL of these trends strive to serve, it’s the employee, and thus the company as a whole. Today’s workplace is about creating an ecosystem. It’s an environment that stimulates minds, reduces stress, promotes health, strengthens relationships, and maximizes performance. 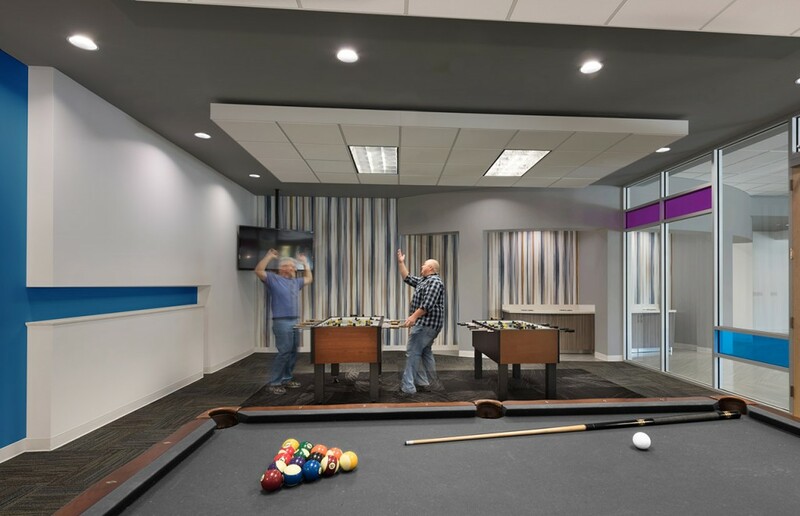 Not all of these workplace trends will work for you or your office, but design strategy is a great place to start… and you may find that a little playtime mixed in makes a whole lot of sense!